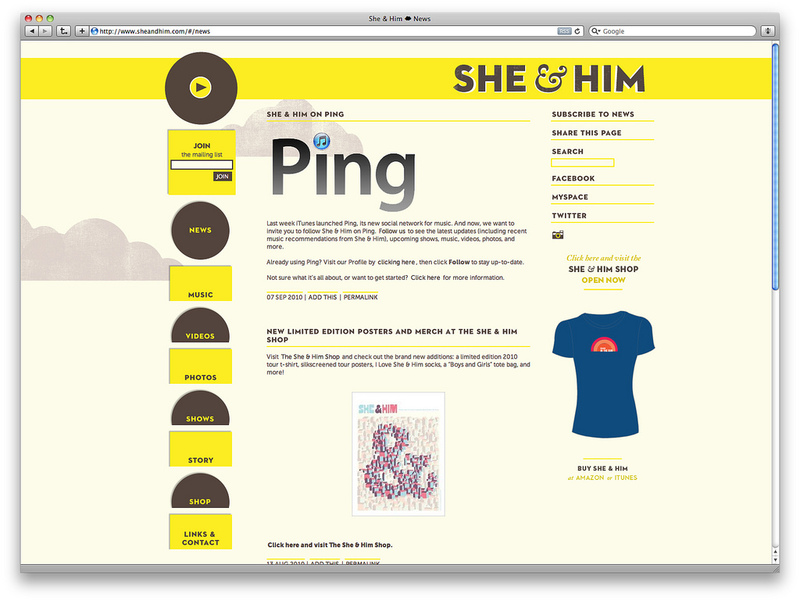 She & Him || This is Generic Dot Cx. I developed this site with the most excellent kate quinby of croakandhum. For type, we're using Neutraface Titling via Cufón on the site's headings. The body text is Museo Sans 500 via @font-face. The disparity in delivery mechanism is due to licensing issues, but none of that should be apparent on the page itself. For backend, the site is actually using tumblr via the api that i access from php. Using tumblr for the backend was something i'd really wanted to do for a long time and the site has the perfect content for it. The clouds actually animate on the website continually, but with a 5 second lead in time, which is a cute little touch we added to make the site feel slightly alive, but not over the top. Similarly, there are a bunch of css-transition animations for various page elements (especially on the grid-page after the initial splash page). Because the record up top is actually a flash mp3 playing widget, the site is entirely loaded using jquery-address so that playback is uninterrupted. This was added in at the very end so that we could have actual permalinks for the entire site that did the right thing and also so that the site could be scraped correctly. Because all of the pages actually exist, but can be pulled into the main site via xhrs, we have a site that crawls well but also works nicely interactively. Sharing via AddThis because they had a much better api, avoid ShareThis like the plague, they totally did not have their act together. Marcos Ojeda is a designer living in San Diego, CA, married to kate ricke and previously employed at khan academy. You may email him at marcos@generic.cx or you may call him at 619 721 3606.